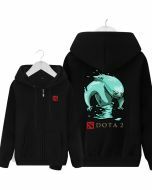 DOTA 2 EVIL GENIUSES (EG) Sweatshirt & Zipper Hoodie, Sweatshirt Hoody Hoodies Tracksuits Pullovers Long Tops Outerwear, on the left chest is Dota 2 Logo design printed and at the back of the Hoodie is Dota 2 Team EVIL GENIUSES (EG) LOGO Design Printed, Pick this EVIL GENIUSES (EG) Sweatshirt & Zipper Hoodie to support your team, if you are true EVIL GENIUSES (EG) fans. this Sweatshirt & Zipper Hoodie should be you must, Three color Black, Grey, Red are available. suitable for men and women, don't miss.